Egg production is a funny thing. Without ever wavering there are stacks of egg cartons at the grocery store, week in and week out, every year, year after year. To get to that there are a number of things that must happen. Light is needed. Hens love daylight, and are not keen on making eggs when the amount of daylight reduces. It makes sense, really: darkness combined with cold means energy reserves are needed to withstand cold, and the hen uses up all she has there. Egg production is down. A few weeks ago just a couple of days of eggs looked like this. Now we can just use the smaller basket when collecting eggs. At market, people stand and look at me, astonished that local eggs are not a year round thing. It is a difficult concept if you have lived for decades, buying eggs at the grocery store: have we ever heard the term "egg shortage"?! I think not! 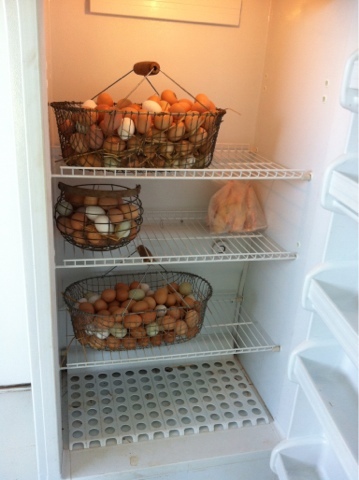 Eggs are always available and plentiful. Except they are not, really. We start a flock of hens every spring, a group of 100 that should start laying eggs right now. We have fed and moved them for months and months, after having them growing in the brooder. Yesterday there were 2 eggs in that pen. Two. The current laying flock of 200 produced 6 dozen eggs. The hens clearing the rows in the garden produced an egg each. We were certain they would not lay any more eggs, as they are not the youngest and they look a little rough. We know and understand why hens are raised nothing like the way we raise them. This daily moving of pens, outdoor living without control of light, feed, strict accounting, mechanical egg collection...is inexact. It can and usually does result in tiny amounts of wintertime eggs. It can make profit elusive, and raising the old varieties of hens we raise can make it even that more of a head scratcher. And yet, the eggs. They are delicious and flavorful. Beautiful in the carton, full of rich yolk color in the pan, clean taste in the mouth. Clean. Chemical free. So we begin the time of year that is difficult, with no where near enough eggs, and with explaining that, yes, eggs are everywhere. In every store. Just not our eggs. There will be days in December that Homer and I will lay claim, with each other, over the 2 or 3 available eggs, where, with indignation, one of us will tell the other "I had plans for those eggs!". And still, at 17 degrees we will haul warm water and feed, and move those pens because those eggs are that good. Worth waiting for. Our flock of 200, and the 8 in the vegetables, and the 100 "fancy egg layer mix" and the 50 Rhode Island Reds and the 50 that had to be moved here when the local authorities evicted them from their suburban back yard...a total of 400 hens, twice as many as this year will lay again. As certain as the sun will shine and the seasons will change. But they will not make a whole lot of eggs between now and the end of March 2013. Which right now feels like an eternity.